With leading world diamond corporation De Beers moving its headquarters to Gaborone, the capital of Botswana in the coming months, it is imperative for the international community to move beyond the rhetoric of Botswana as the “African Miracle” and address the human rights violations that have stemmed from resource exploitation. The San, indigenous to the Kalahari Desert in Botswana, have been systematically and forcefully removed from their land since 1995. Neither the government of Botswana or De Beers has been held accountable for this relocation, and the San continue to suffer as a result of the discontinuation of basic services. Botswana has earned its reputation as one of the most stable, secure examples of a multi-party democracy in Southern Africa – so stable, in fact that it has been labeled an “African Miracle.” A thriving economy, the lowest HIV/AIDS rate in decades, and elevated education rates are evidence of this high rating. Previously a haven for South Africans during apartheid, Botswana currently remains one of the most diverse countries in its region, with a massive immigrant refugee population from their more tumultuous neighbors Nambia and Zimbabwe. Botswana's wealth and conservative economic policy have kept it relatively free of externally enforced programs. It is not a client state for the Western world and acts with great autonomy to further its economic stability and agenda. As a result of this general economic stability, the public sector remains large and well-paid, has remained immune from the negative effects of outside scrutiny, and is not a target for secular missionaries or emergency aid programs. While this may be beneficial for the Tswana majority, the San are not a part of this equation. With a lack of aid programs and without Botswana on any party’s watch list, the San are left with nothing. According to a profile on the DeBeers on Business Insider, “Diamonds from Botswana were considered valuable enough to give the government of the country a 15 percent share in De Beers in 1969. All rough-diamond mining and distributing is done by Debswana, making it the biggest non-government employer in the country. The deal is still in place today, and there's even talk of increasing Botswana's share to 25 percent [in De Beers].” An even greater achievement lies in the October 2013 decision for De Beers to move its headquarters from London to Gaborone, the capital city of Botswana. The headquarters move came from a 2011 decision by De Beers’ new owner, mining giant Anglo American. The move seems to be a mostly practical decision with Botswana holding some of the richest diamond mines in all of Africa, however, there are allegations that political motives are also at play. According to Varda Shine, who runs De Beers’ Global Sightholder Sales, "The Botswana government did not come to De Beers and say please transfer your business. The Botswana government said we would like you to sell the Botswana diamonds here.” The history of the diamond market in Botswana, and particularly De Beers’ involvement in Botswana, stretches back 1967 when the first diamonds were discovered in the Kalahari Desert. By the 1970s, De Beers and the government of Botswana formed a national diamond corporation, Debswana, with a 50-50 shared ownership. The Central Kalahari Game Reserve, or CKGR, was established in 1961 by the colonial government to conserve natural habitats and for hunting and gathering activities of the tribal populations living within its boundaries. The government drilled water sources for the inhabitants and provided welfare, education, health, and medical services to the San inhabitants of the CKGR. By 1995, the government began relocating thousands of the San, who are indigenous to the region. The government insists that these two incidents—the discovery of diamonds and the relocation of the San—are not linked, instead stating that it could better provide the San people with pensions, food handouts, and other benefits outside of the Reserve. However, many of the San did not want to leave and began fighting the relocation in national courts. In 2013, the San successfully won a landmark case in Botswana’s highest court. The case ruled that the San had been evicted illegally and that they have the right to live on their ancestral lands inside the reserve. Unfortunately, as noted in the most recent report to the United Nations Committee on Eliminating Racial Discrimination, or CERD, the Botswana government has largely ignored this court ruling. Elimination of services and racial micro-aggressions are evidence of this. Historically, the San have been shut out from the political decision making process in Botswana. Since its independence in 1966, Botswana has been dominated by a single political party, the Botswana Democratic Party, or BDP, which is controlled by the Tswana majority. Several laws in Botswana have been criticized by both the United Nations Human Rights Council and by the CERD for discriminating against non-Tswana ethnicities, effectively shutting out minorities from political participation and shaping Botswana’s societal and cultural policies around Tswana tradition. Thus, it has been difficult for the San to fight their relocation from the Reserve. Despite the case being brought to court in 2006, the Gana, Gwi, and Tsila tribes of the San have not returned to the Central Kalahari Game Reserve. In addition, death tolls have increased among the San due to dehydration, depression, and malnutrition. The government has even allegedly been drilling water holes for safari tourism and resorts, and arresting the San if they try to resettle anywhere near the well. It is crucial that the international community does not let De Beers’ headquarters move to Gaborone occur without speculation. An indirect violation of human rights is present, and the combination of a monopolizing private company and a government who is benefitting from intense economic advancements is the perfect storm for violations to go unnoticed. 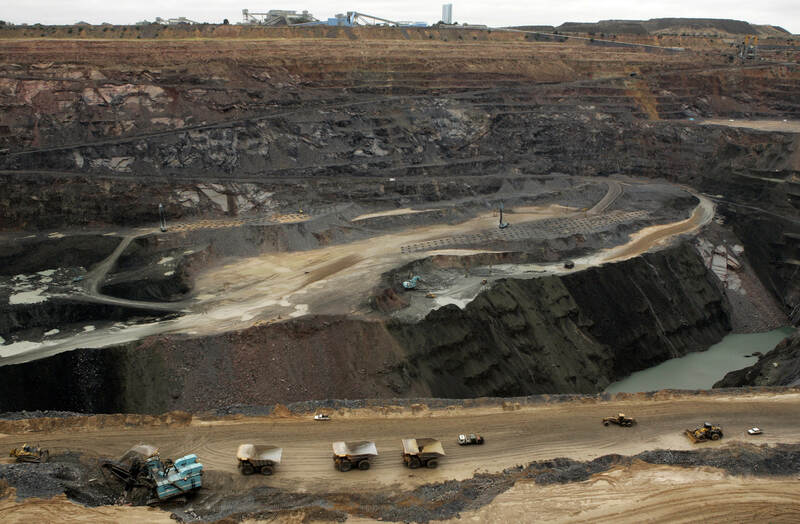 Photo: An open pit is seen at a Debswana mine, a joint venture with De Beers and the Bostwana government. (AP).